Can you believe it's almost Christmas? Where did the month go? I've already been to three Christmas parties and I have at least one more on the horizon. If you are looking for Rachael Ray's Christmas recipes, make sure you check out her Christmas in 60 menu. It looks like an interesting break from your traditional Christmas meal. Also, keep an eye out for Everything Rachael Ray's first series, A Rachael Ray Christmas, which will run next week. 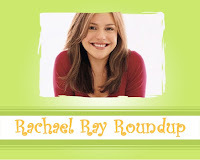 Here are this week's Rachael Ray posts from around the blogosphere. If you try a Rachael Ray recipe, visit a restaurant she recommends or just shared some Rachael Ray news, let me know so I can include your post in the Roundup. You can email me at everythingrachaelray at gmail dot com. Get some Christmas shopping done! This Mediabistro FishbowlLA post is worth a read (even if they can't spell Rachael's name right) simply because it refers to one of Rachael's anti-fan groups as "an entire community of nearly-literate hate monkeys." Mwa-ha-ha. NBC News' Brian Williams writes a blog called the Daily Nightly and says: "There are a few simple, constant rules of television: Rachel Ray is always on (she is usually cooking, somewhere, on some channel) and so is the guy who sells "OxyClean" and those new wall hooks that can be used to mount a frozen turkey in your den." Brian made a funny (and also can't spell Rachael's name). We kept hearing that Rachael Ray sent three meals into space, but they only named the Thai Chicken. ABC news gives us the other two dishes: Swedish meatballs and vegetable curry. As long as they don't eat those two together, they should be happy. Rachael Ray has maintained her 2.1 rating, according to Broadcasting & Cable, and "was the only new show that improved its average time period rating over November 2005 (up 9%) in metered markets." Nicole Weston at Slashfood prefers her bananas blended rather than whole in a hot drink, as recommended by Rachael Ray for Hot Buttered Rum with Banana. Lorie Byrd has some great adaptations for Rachael Ray's ever popular fudge wreath recipe. I appreciate the refreshing positiveness of this Rachael Ray recipe post from Daily Eats. Yeah for positive people! Cheers to that! Wouldn't we all have been disappointed if Jacob at Food Network Addict hadn't worked his magic on that picture? I mean, that one was almost too easy for him. Cate at Sweetnicks is braver than I am. She tried this month's Burger of the Month from Every Day with Rachael Ray, the Beef Wellington Burger. What would Gordon Ramsay say? The recipe includes both pate and cornichon, which means I will never ever ever make it. In addition to be an entertainment lawyer, Rachael's husband John is in a band called The Cringe. This article talks about their new CD. iFit and Healthy breaks down the nutritional information on a Rachael Ray holiday dessert. Laura Seewoester of Pegasus News provides a recap of a Rachael Ray book signing appearance and has some great photos of the controlled chaos.